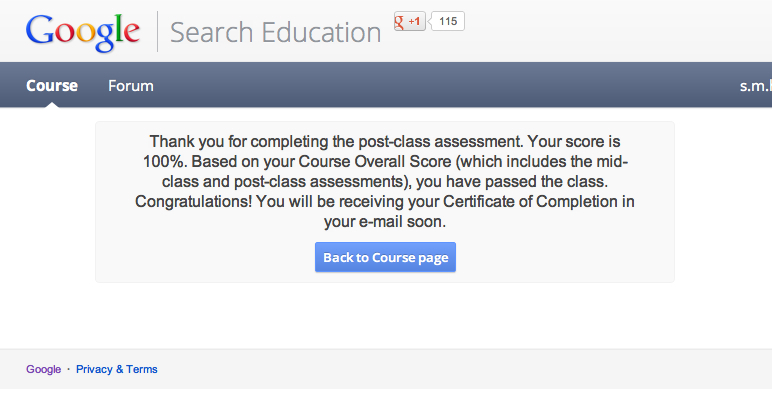 Kinda Learning Stuff: Finished a MOOC! Hooray! 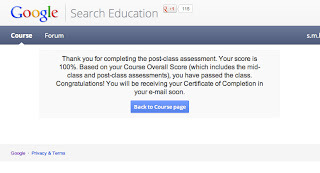 I finished my first MOOC!!! The Google Power Searching one which wasn't massively complex... and it didn't feel massively massive either! It came in a pretty standard format. Watch a video... do some simple activities... repeat... do a mid-course test... watch video... do simple activities... do post-class test. The thing is, I completed it. Which is more than I've done with any other. What was different about this one? 1. Well, the format was familiar. No, it didn't set the world on fire in terms of jamming in every technology under the sun... and no I didn't take part in the discussions (though I did look at a couple)... but it was straightforward. 2. It was genuinely useful. The search techniques are immediately transferable into practice and though a lot of it wasn't new, there were sufficient 'ah ha!' moments to make it worthwhile. 3. It was short. The sections were digestible. 6 x 50 minute sessions with videos which were anywhere between about 3 and 8 minutes long was perfectly easy to dip into. And the end was in sight quick enough for it to fit with everything else. 4. I felt in control. I didn't have to join in with the interactive bits if I didn't have time. If I didn't even have to watch the main videos if I didn't want to - there were text alternatives provided which made it scannable. There were no hurdles of forced participation and that worked for me. For me, what makes a successful MOOC (so far)? A format that isn't too complex, a tangible payoff from studying and timings / delivery which fit in with everyday life. MOOCs that haven't worked for me have bombarded me with 'stuff' to the extent where I felt I was drowning. Or encouraged me to join in with others and gave me activities which would require a hefty chunk of my time to complete and share (sharing something always makes you spend more time on it than you would do if you were on your own and didn't have to show it anyone). Plus, if there are no bits which are transferable then you really *really* have to be motivated to stay on course. Would I do a MOOC in this format again? Yup. And I quite enjoyed it!